When the brakes were working. I started Heat 1 on the second row outside, not the best place to start… however, I actually got a really good start. I couldn’t believe how quickly I was moving through the pack and before I knew it I was in second place behind Ashley England. I remained in second place for a while and then dropped a couple of places before a yellow flag came out. 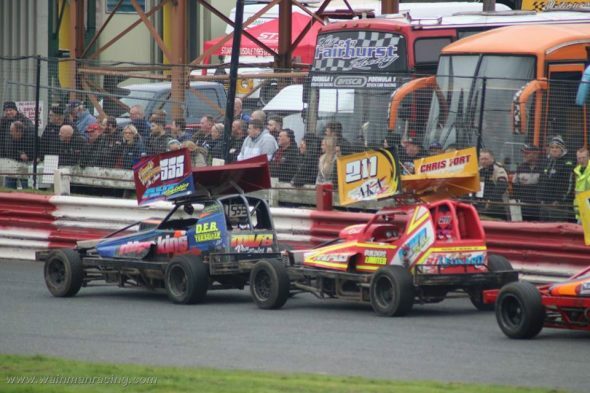 I think on the re-start I was in about 4th or 5th, I can’t quite remember, and after the re-start I managed to hold my own. I finished the race in 8th place which I couldn’t actually believe! I had a lot of people telling me how well I drove and all my family were so excited at how I drove too! This means that I actually qualify for the final and I’m not in the Consolation! I started the Final at the front of the pack but didn’t have a very good start. I soon discovered that my brakes were playing up a little bit. I was struggling to stop my car going into the bends, my brake pedal was rock solid making it extremely hard for me to press. This meant that I couldn’t go as fast into the bends as I would have liked to and had to slow down earlier in order to stop. My leg towards the end of the race was so painful from having to press the brake pedal so hard! However, we couldn’t fix this for the national as we needed a smaller brake cylinder. I was still happy that I finished the final though because I just want to keep getting laps in. As I was going out for the National I kind of knew that the race would go very similar to the final as we didn’t have enough time to sort my brake pedal and it was still rock hard! I still managed to finish which again I was happy with, even though I couldn’t feel my leg afterwards! We managed to sort my brake cylinder before going out for Heat 1 so I lined up and tried to test the brakes on the rolling lap, however it is a little bit different to when you’re racing! I had quite a good start and was keeping with the yellow tops, I was testing how fast I could go into the bends and how hard I could brake so the first few laps were just for me to get used to that. On one bend I went in a little bit too fast and nearly hit the fence but managed to hold it and continue. I last bended my brother to take seventh place! I have qualified for the Final again and I was ecstatic. Little Ted pulled up next to me after the race and put his thumb up to me and was laughing that I last bended him! It rained before the Final so we put our wet tyres on. I swapped all of mine except the back outside. Within the first few laps I could tell that my tyres weren’t quite right, I couldn’t get any grip coming out of the bends meaning that I wasn’t really as quick as I would have liked to have been. A few yellow tops, including myself, all went into the fence. I was parked facing the fence so wasn’t able to see any traffic coming which was quite scary. I managed to get my car started and set off again, obviously at the back, but I was just pleased to get out of a potentially dangerous spot. I managed to finish the race, without a position, but still happy that I finished. I took my back outside wheel off as it was no good , but it will be a good one for Sheffield next week, and put a better one on ready for the National. Straight away in the National I could tell that changing my back outside wheel made a massive difference. I was much more on pace and even kept up with Daniel for a few laps! Little Ted had been taken out and was parked in a very dangerous place, I still can’t believe that the marshals just left him there and didn’t put the yellow flags out, they are meant to be there for drivers safety! I was catching a blue top and went to hit him wide to pass him, we got tangled up and then a white top hit me and got tangled onto the other side of me. We all hit Little Ted who was parked up causing a lot of damage to his car. All three of us who tangled up pulled onto the middle. I was a little bit annoyed because there wasn’t even a lap to go until the finish line so I didn’t actually finish, but I was more concerned as to whether Little Ted was okay as the damage looked quite bad. I looked over and luckily he was okay, he got out of his car fine. Hopefully the marshals and staff will take their job a little bit more seriously next time. Even though I didn’t get the best results in the world, I am so pleased with how my car went on tarmac all weekend and also that I qualified for both finals in my heats! This makes me 24th in the points meaning that I have made it to blue grade! I am so so happy as I didn’t think that I would progress this quickly! I just want to say a massive thank you to everyone who helps me at racing, Mum, Dad, Karl, Little Ted, Sean, Binsi and Raz and also Andrew Kilcoyne for helping me get strapped in before races! Danny’s best result of the weekend was third place in Heat 1 at Hednesford. 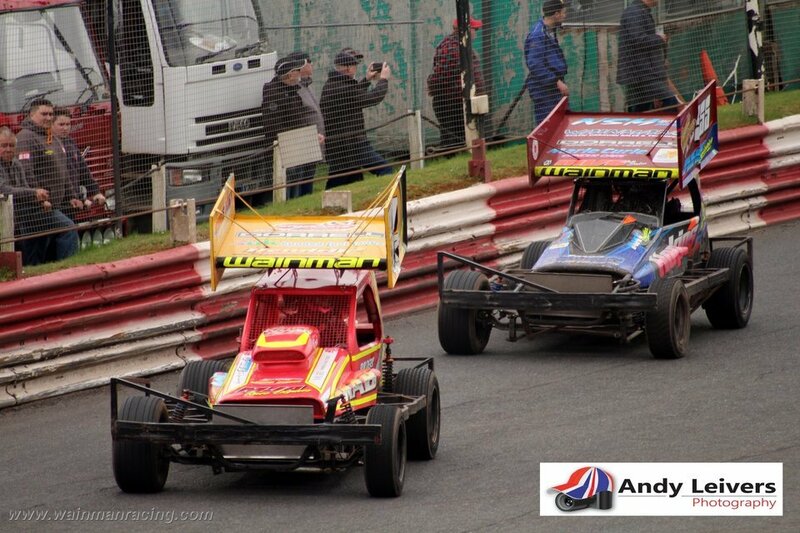 Well, it’s a full weekend of tarmac with Birmingham and Hednesford, both qualifiers. 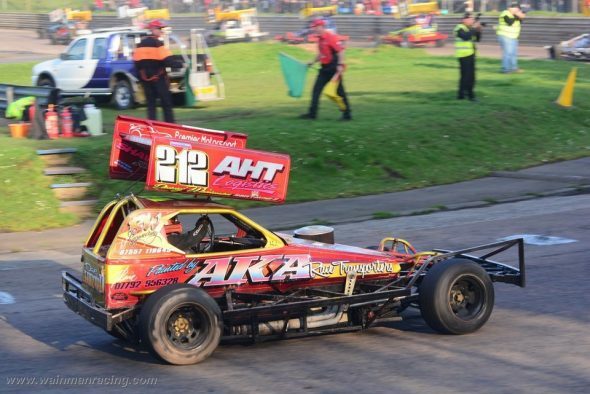 We haven’t had time to get any of the tar cars finished so I decide to ask Derek Brown, who hurt his ribs other week at Skeg if I can borrow his car for a bit. I’ve had a decent start to the season points-wise, and I want to try keep it going. 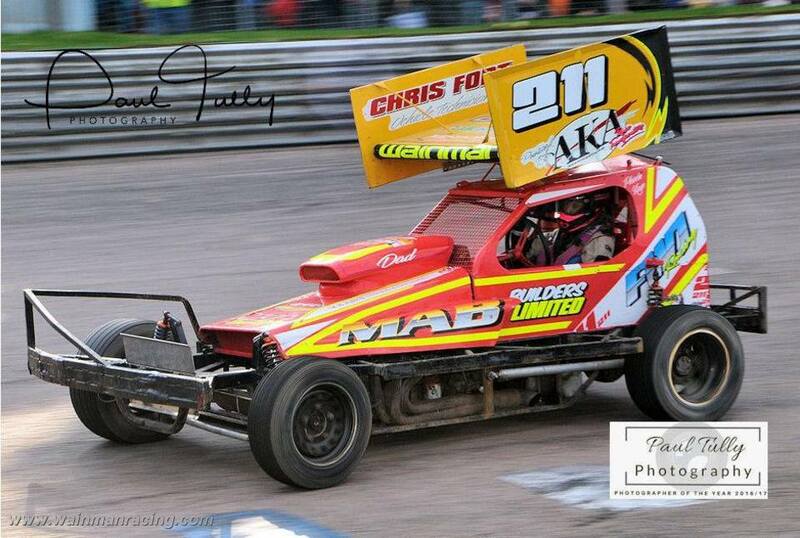 So we alter Phoebe’s car back to tarmac settings and also try our best to make Frankie’s shale car tarmac-ready. 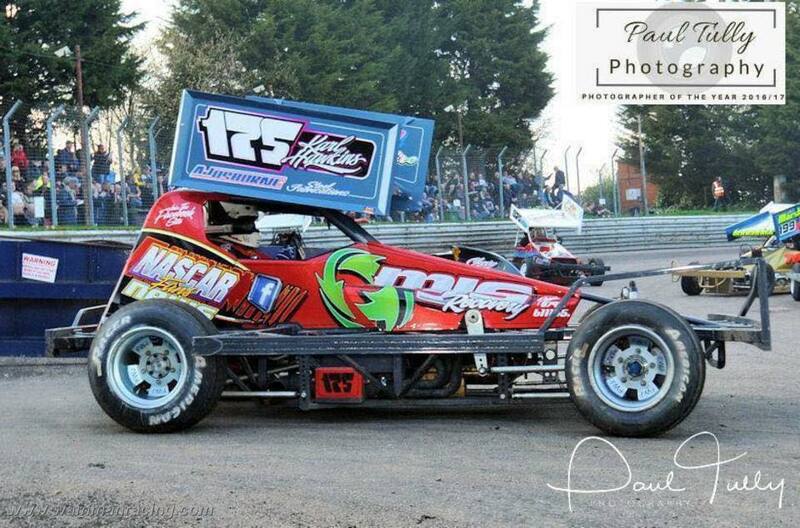 It’s been a really busy week with plenty of work to do, plus helping Karl finish his brand new tarmac car. 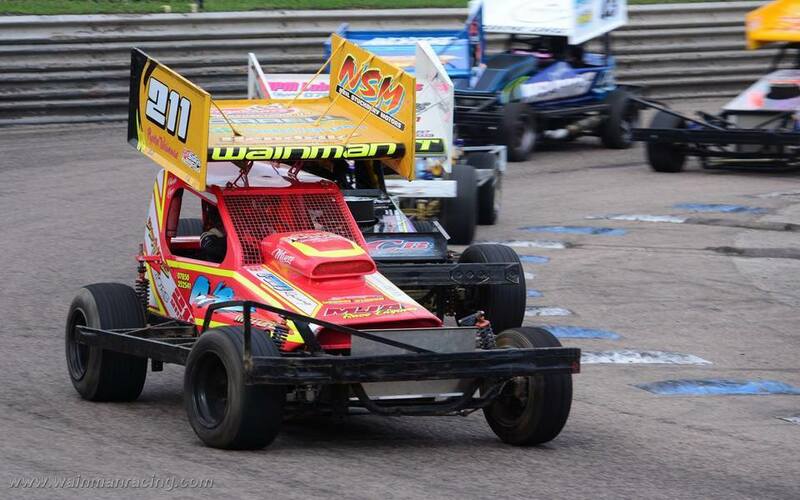 Karl scored a load of points in the first weekend with his brand new car. We had a flying visit down to Birmingham on Wednesday afternoon for some parts delivery and collection and let Karl have a few wet laps practice just to make sure everything was going to function correctly. It was still a late night Friday getting four cars ready and loaded, and I stupidly volunteered to do all the wheels and tyres and some five or six hours later they were finished. We managed to get three of the cars loaded by 2.30 in the morning, leaving just a few jobs left on Karl’s new machine to finish. We left the farm at 10-30 so we could get plenty of practice in. A good trip down with a couple of Costa stops meant we arrived at the track at 2 and got everything unloaded and ready to go out. My car felt really good in practice and I was looking forward to a good meeting. I was going really well in my Heat until I caught Harry Steward’s front inside bumper on way past and ripped a massive hole in my rear tyre, so that was the end of my race. A fresh tyre and a few minor suspension tweeks and we were out for the Consolation. A solid second place guaranteed me Final qualification and as Birmingham is a lower grader track I was more than happy with that. The Final was a good hard race. My car felt good and with the quality of lower graders out there now I managed a respectable fifth place, only made better by the winning car being my old tarmac car piloted by Ashley England, so a brilliant result for us all at FWJ Racing. I managed to work my way up for another fifth place in the National which secured me the superstar grade award. Something borrowed…. thanks to Derek for the car, and Phoebe for the wing! A short drive to Hednesford on Sunday morning meant we were in plenty of time to get unloaded, and set to changing all the gears ready for one of our biggest tracks. My mind was not fully concentrating on my own car and racing today as it was Phoebe’s first outing in an F1 at this track, and after suffering first hand how dangerous this track can be, part of me was more than a bit worried. I made sure her car was proper checked and her tyres and shocks all okay, then it was just down to 16 laps and me nervously trying not to show everyone my concerns. It was obvious after just a couple of laps that she was well at home at our fastest track and I was worrying about nothing… she even managed to hit Frankie out the way on the last lap as they recorded an awesome seventh and eighth place, meaning qualification into the Final. So with the kids all sorted and me in a happy relaxed state, it was out for my heat. The car felt really good and was handling perfect as I moved my way through from the back. Quite a few tussles and tangles made it hard work but I managed to qualify in sixth place. All five of us had qualified in our heats so we all sat and watched the Consolation in a relaxed state of mind, a new experience I think, ha ha! So just before we get called for the Final the heavens open and it’s all hands to the pumps with four sets of wet tyres to fit. Luckily we were expecting rain so I had stacked all our tyres in sets for each car and made sure we had 4 nut guns fully charged and fitted with the correct size sockets to perform the changes. 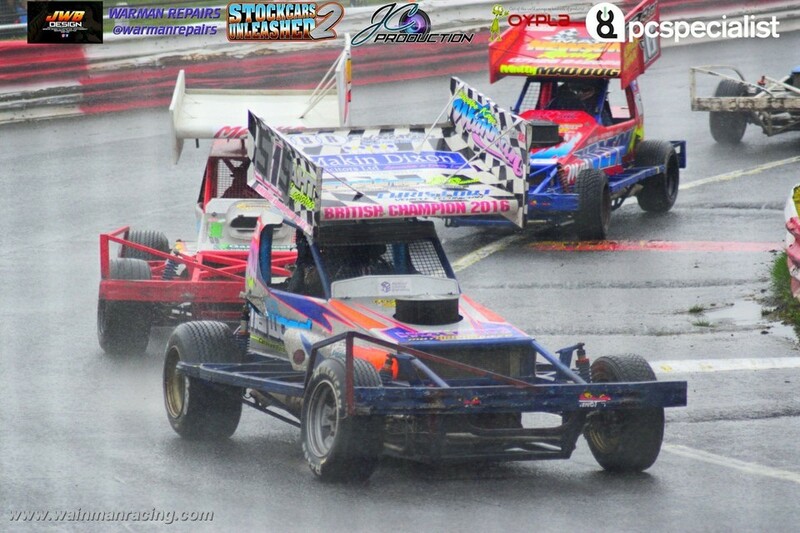 So we have another wet tarmac Final and from the green my car felt fast. I managed to watch Frankie for the first few laps as he had been struggling with the set up on his shale car all weekend. He is very quick and was sat one car behind 464 on the yellows so I knew he was on it. With three laps to go I am only just five or six cars behind the top 3 but time had run out and I had to settle for fourth place which I was more than happy with, and would of taken if I had been offered before the meeting. Out for the National and the track is still wet and as the green flag drops Matty Newson, who was starting on my inside, gave it a massive boot full and totally lost it, rattling me straight up the fence before I had even got my visor down. I managed to get going again with a badly buckled right rear wheel and finished the race in eighth place, so another good haul of points for the weekend meant I’ve closed the gap on the leader in the qualifiers and moved myself into second spot. Hednesford was the last meeting of the grading too, so I’m sat in number one spot in that. So a good start to the season for me. Some good meetings for Frankie means he has kept his red top again and also sits in a very respectable tenth place in the qualifiers. Phoebe has also picked up some very good places and racked up enough points to be sat about 24th in grading list and has completed one of her goals for the season, which was to make blue roof. I’m thrilled as a dad to know they’re both getting results and doing well, Phoebe especially as she has just made the massive step from the V8 formula. It’s been a bit worrying for me as her dad, wondering if she is going to handle the pressure and commitment of the F1 but she has absolutely blown me away with her “get stuck in there” attitude and her willingness to keep going. She’s had some good hard hits and not complained, just backed out and carried on, and as an experienced driver it’s been an absolute pleasure to help and watch them both progress. Well that was another weekend done, and a fairly successful one too, so all that was left was a stop at the Hollies truck cafe on the way home to have my breakfast, dinner, and tea all in one sitting…!